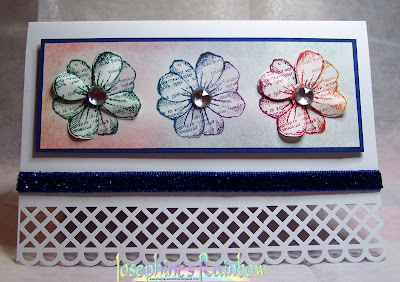 Well here we are at the final challenge for 2011, but before we get to that I have to announce the winner and Top 5 of our Heat Embossing challenge which have been chosen by Josephine. We had some fabulous entires, thank you. A beautifully rich card, with some fabulous triple embossing. Congratulations ladies, would the winner kindly contact me via the email address in the righthand sidebar and all of you please feel free to display our badge. 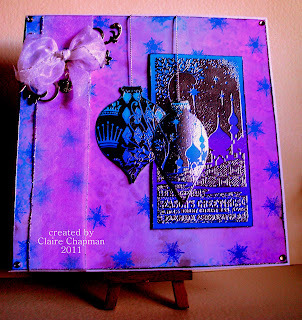 We at Crafty Cardmakers are sad to announce that this is the last challenge that will be sponsored by Joanna Sheen. We would like to thank Joanna for her enduring support of our challenge blog, so please take advantage of your last chance to win Joanna's fabulous prize of a £10 voucher for her online shop which is crammed full of goodies with new stock arriving all the time! Thanks for everything Joanna! Next year we will be back with some exciting new Sponsors, along with our regular sponsors One Stop Card Crafts and The Stampman. Now onto this last challenge for the year which has been chosen by Tracy, who has picked Use It Three Times as her theme. Use the same stamp/image three different ways. It could be the background, main image and a tag to match for example. (ie Christmas Wrapping Paper, Greeting Card and Gift Tag) Using different colourways is another way or, even, as a couple of the team have done three different cards or the same image three times on the one card. 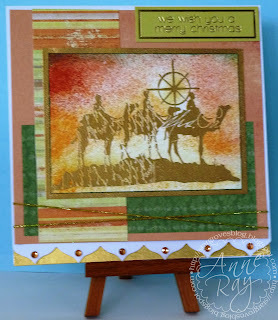 I choose this theme for the challenge as I think we sometimes forget how versatile stamps can be. 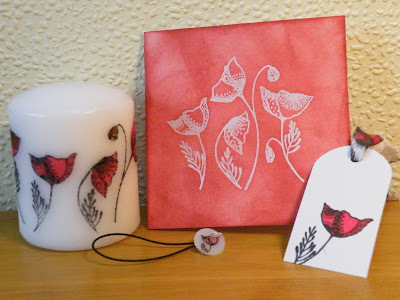 I have used the Swirly-Whirlies Poppies from Little Claire's for my collection of projects. I made the card using the resist technique and some distress ink. I stamped the tag and seam binding both of which are coloured with promarkers. 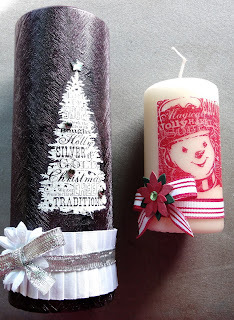 I used some tissue paper to create the candle and dug out my shrink plastic to make a mobile charm. These are all for a friend who loves poppies. I can't wait to see what you all create for this challenge. For this card, I kept things fairly simple. The stamp I used was a Craft Stamper freebie a while ago, and I stamped it using a Big and Juicy ink pad in Mountain Meadow, choosing different areas of the pad. I layered two of the flowers, and finished all three with sticky gems. I shaded the background using the same ink pad and an Ink Duster. Some matting, a Martha Stewart border punch and some velour ribbon, and that's it! I was a bit stuck with this challenge for a while, but after some thought came up with this idea. I've used the same little flower in a vase stamp 3 times. Once on the front of my card, then on the vellum insert &amp; finally on the envelope. I must admit that I was quite pleased with the result as I don't usually decorate inserts or envelopes. 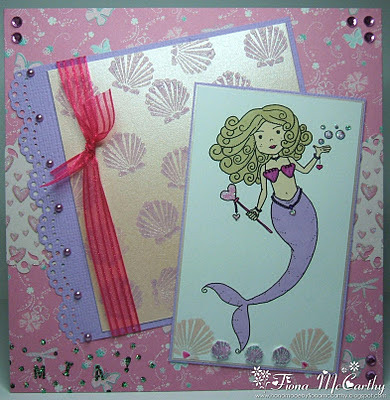 I decided to get ahead with myself and make my daughter Mia's 9th birthday card (its not her birthday til end of Jan lol) I have used a small magnolia shell stamp 3 times, the first time I have used it is with purple versamagic chalk on pink pearl card and then heat embossed it with holographic powder.I have also used the stamp in the main image with pink versamagic and the 3 little purple shells are made from shrink plastic.This was almost impossible to do as the stamp is so small the shrink plastic kept blowing away lol The image I have used is a digi from Pollycraft,the other papers are from the Me to You paper pack and Fizzy Moon paper pack. Ribbon,pearls and gems are all from my stash. I chose to use a Christmas Stamp I've had for ages. It's a Christmas Angel from Anita. I stamped her onto tissue paper to make the candle, then onto white card for the Christmas Card and finally onto Shrink Plastic to make the bookmark. All three images were coloured with Derwent Studio pencils. I see that I've had the same ideas as Tracy but I promise I hadn't seen hers until I'd uploaded my efforts. I must admit that I hate to make the same card twice, so I liked this challenge. 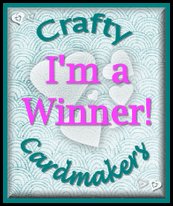 I have used a lovely Woodware clear set to create 3 different cards. 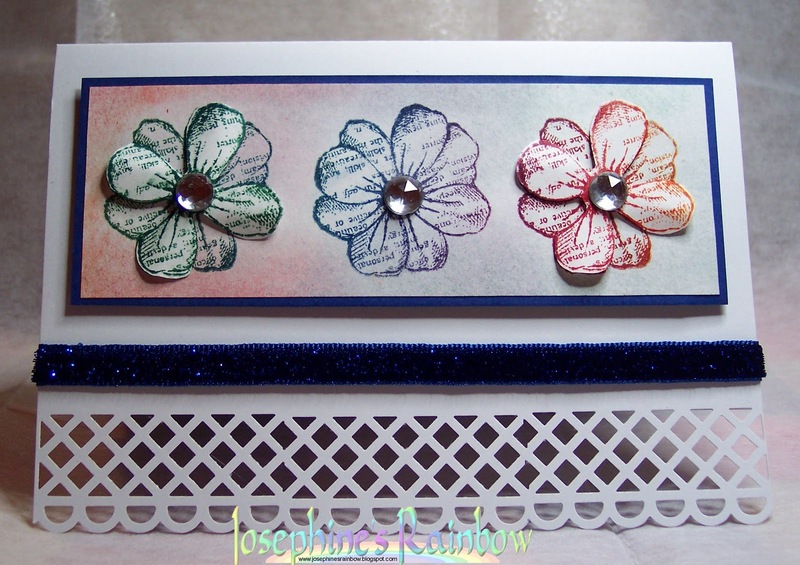 The main image on each card has been stamped onto is piece of handmade background from my stash, but you could just as easily use ready made background papers you just won't be able to bleach out the flowers.. 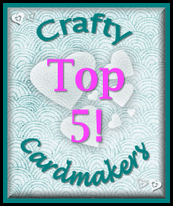 Pop over to my blog to get instructions on how to make each card. 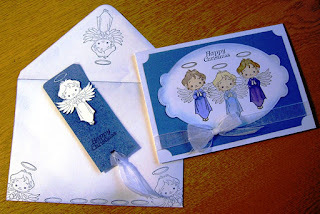 For this challenge, I used a freebie rubber stamp of a small angel that I got with a magazine. I stamped it three times, masking the centre angel and then coloured them with promarkers. I used the same stamp to decorate the envelope, and I used an offcut of the blue card with a stamped angel decoupaged onto it as a book mark. I decided to make 3 cards using the same image in 3 different colours! I used the same layout for each card but stuck with the "3" theme and used only 3 patterned papers on each, 3 strands of ribbon and on each card 3 different embellishments in groups of 3! Using 3 flowers, 3 buttons and a bead pin head with 3 beads! For my card I chose to use a sweet little digi stamp from Pink Petticoat which I printed directly onto my card and added a little colour using Promarkers. I cut out a pretty border which I layered up with some copper mirri and a piece of green velvet ribbon. I added three wee pearls which I colour tinted using the same shade of Promarker as I used on the mistletoe. I decieded to make a simple and clean christmas card for this challenge. I used the Delightful Decoration Stamp Set from Stampin Up. 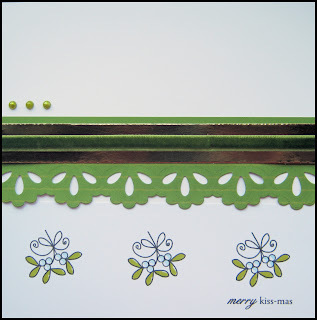 The fir branch is a creatables from Marianne D. The ink and paper I used is from Stampin Up too. I embellished with rhinestones and a little bit og liquid pearl. I decided to make a gift, card and envelope for the Use it 3 times challenge, I stamped my image twice onto shrink plastic and coloured it with Promarkers then used a Nestability die to cut them into circles before shrinking them and making a pair of earrings. I then made the card, cutting an aperture and frame again with the nesties and stamping just the centre part of my image onto the green backing paper. I also die cut the fab glittery border at the bottom using a new die from Memory box. Finally I made an envelope to contain the gift card, stamping the image onto white cardstock and again colouring with Promarkers and cutting out a red scalloped piece of cardstock to frame the image. I then ran a piece of Kraft paper through my ribbler to finish off the design. I never got around to making my Husband a Christmas card last year so thought I'd better make sure I did this year or he'll start to think I've gone off him!! Firstly I flipped the image of " Miss Mistletoe" using "Word" and coloured all three images with Copic's. Printed out Sentiments again using Word. 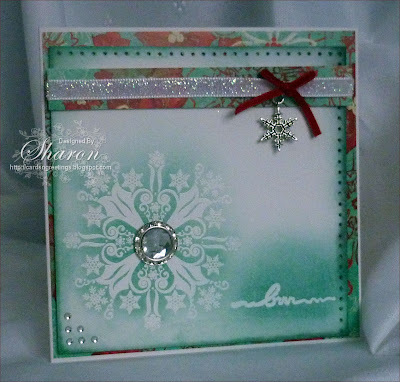 I've matted and Layered using Printable Pattern paper fro Bearly Mine Crafts and Core'dinations card stock. before finally mounting the sentiments and images I wrapped ribbon around the whole length of the card securing with DST in the areas that will be hidden and then tied the bow. I then decorated with die cut Holly &amp; Mistletoe using Perfect Pearls to make the berries. I'm another who doesn't like to make the same card more than once, I would be useless at Wedding Invitations! So I used this lovely free stamp that came with Card Making and Papercraft and stamped it three times and coloured it three different ways. I used the same layout for each card, but used different papers to go with the different colours. I shall be announcing the new DT in a couple of weeks time, as this time of the year is somewhat hectic and I haven’t had a chance to check all the entrants out yet. We will be back with a new challenge on 9th January 2012 and look forward to seeing you all back then, but in the meantime please add your project for this last challenge for 2011 below. 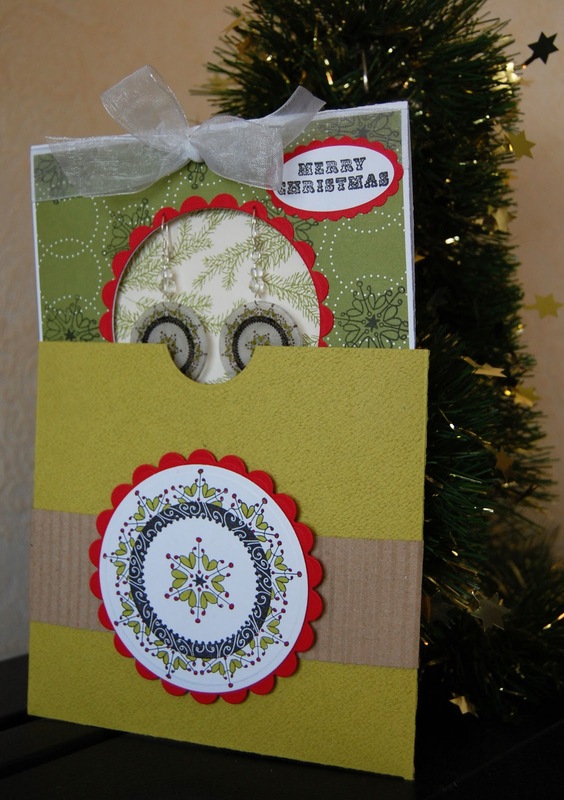 From all at Crafty Cardmakers we wish you a very merry Christmas and a prosperous, healthy and crafty New Year! 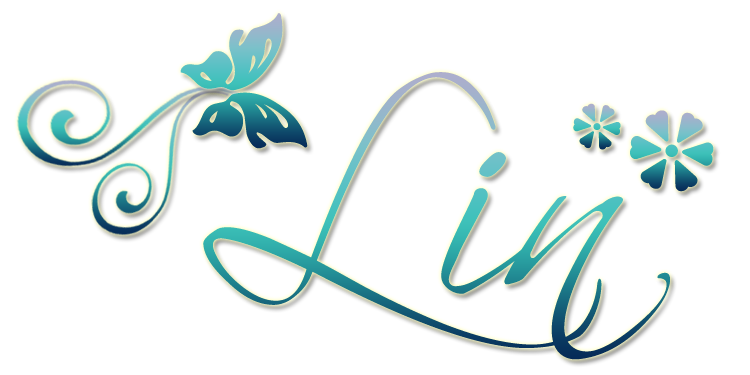 PS IF ANYONE HAS HAD ISSUES WITH MR. LINKY PLEASE TRY AGAIN AS I HOPE I HAVE NOW FIXED IT! Thanks for your entries to our recycling challenge last time. There were some fabulous creations amongst them and I had a really hard time choosing a Top 5 and Winner. If the winner could contact me via the email address on the right hand side bar I will sort your prize out for you, and please feel free to display the winner’s and top 5 badges on your blogs. I am also extending the Design Team call which I posted last time as I realise that recycling is not to everyone’s taste and I wanted you all to have a chance to enter if you wanted to. Don’t worry about taking on too much commitment this side of Christmas because we won’t start you until we come back after our Christmas break in January, so you can apply and still get your Christmas cards made in time! 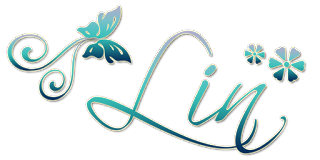 If you fancy a spot on the team please read all about it here, and add your name with your heat embossing challenge in the linky list below, adding DT after your name. If you did apply last time, don’t worry we will still be choosing from those entrants as well. We are sponsored for this challenge by The Stampman and on offer is this fabulous prize of some Starburst Stains pots. We are kindly sponsored for this challenge by The Stampman (and Lady of course!) who are offering the winner the lovely prize pictured above. Deep, rich, vibrant colours with a two-toned shimmer! These are all dye based products, which give them that vibrancy and can be used on any porous surface, (paper, wood, fabric, balsa, chipboard, etc). Instructions on how to use: Add hot water, (filtered preferably, especially with the stains), let sit at least 10 minutes. Shake or stir before each use. Well, this time on the Spotlight Challenge, it's my choice of technique, and I chose Heat Embossing. You can do anything you want as long as it includes some heat embossing. I used this technique for the background on the card below. The butterflies were stamped with Versamark ink onto a shiny shoe catalogue then embossed with gold. 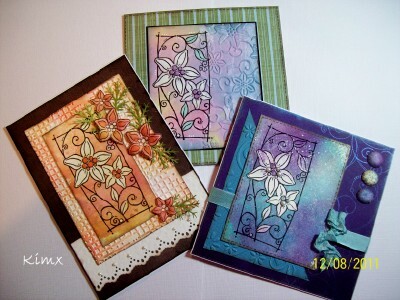 For the centre image, I stamped and heat embossed the image onto white card, then I coloured the image with Sakura Stardust pens which give the end result a 'jeweled' effect that I like. For this challenge I used a bargain alphabet set, some Versamark ink, clear embossing powder and lots of card scraps to make corner bookmarks to go into my Christmas cards just to let people know I'm thinking of them. I enjoyed making these but next time I don't think I will make quite as many as 40 took a while. There are some basic instruction on my blog if you want to have a go at a corner bookmark. For this challenge I used a wooden stamp that I found whilst rummaging around for something else! I used Versamark to stamp onto Clarity cardstock and embossed with Cosmic Shimmer Bright Gold embossing powder. I then layered the card onto some plain black cardstock and some gold cardstock I had in my stash. For the base card I folded an A5 sheet of black card in half, and embossed the corner using one of my favourite La Blanche foam stamps. To complete the card I used a pink satin ribbon tied in a simple bow. The background panel has been created using an Embossed resist technique which I will explain in detail on my blog. The main panel has been stamped and embossed and then coloured using distress inks which I have sponged over the image. The entire panel has then been coated in clear embossing powder which when heated gives a slightly pitted and shiny finish. The stamp set is a clear set by Artemio. Not an easy challenge for me, as most of my attempts at heat embossing seem to turn out a bit squiffy. lol. Anyway, practice makes perfect & here's my effort. I covered my card base with stripy paper, coloured the wooden numbers with my Whispers pens, then double embossed them with pink embossing powder. I matted them onto green card & doodled around the edges. Some worded ribbon, a few pearls, a punched heart & a peel off sentiment complete my design. I luuurve heat embossing but don't do it often enough, so I really enjoyed this challenge. I used a stamp from Inkadinkado, stamped it in Encore silver and then embossed it with Holographic EP. For this card I decided to try out a new technique I've learned recently called faux enameling to create the base background to the card. I also created the golden globe by triple embossing. I'll describe both of these techniques in detail on my blog. The images have all been aged and stamped with distress inks. I chose gold as a contrast for the embellishments and layering. For my card I have stamped the Stampin Up! Medallion stamp with Versamark Ink onto black card and then Heat Embossed using a white puff up Embossing powder.After cutting out the Medallion I then added Gem to the blank circles on the embossed stamp. 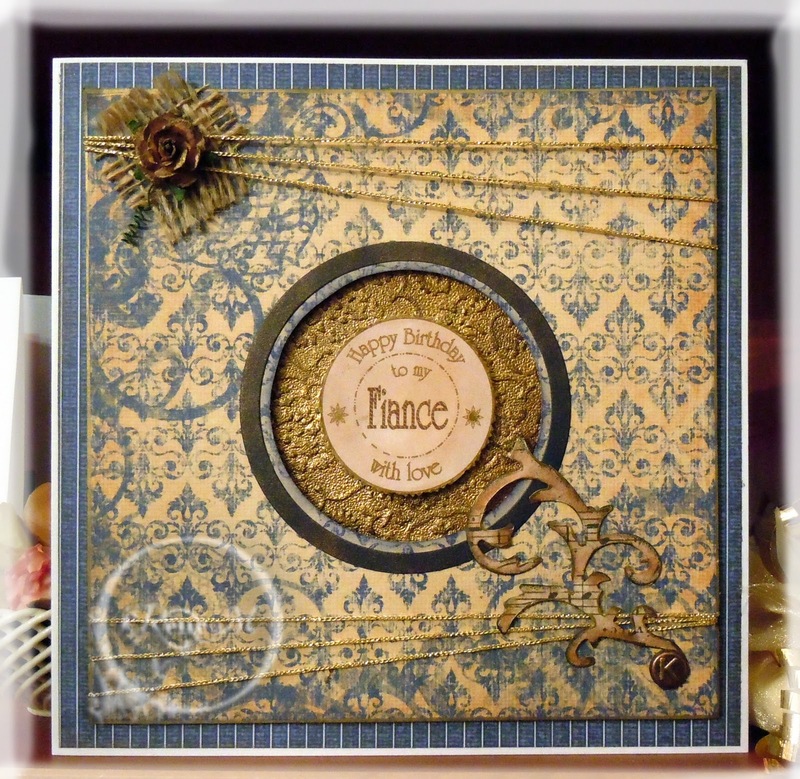 I then matted and layered onto my base card and added chiffon ribbon. The patterned paper is Sprinkled with Twinkles by Pink Petticoat. I have edged with lavender Stickles. For this card I started by covering my cardstock with designer paper then I die cut the bauble shapes from 3 different patterned papers and inked them with a Versamark (clear) embossing pad and added ultra thick embossing powder and heated it, repeating the process 3 times until I had a good thick covering. I then inked up some flourish stamps with gold ink and while the embossing powder was still in a liquid state stamped the flourishes, waiting until it cooled a little before removing the stamp. I added ribbon and threads and a stamped greeting to complete the card. I usually like heat embossing, but I struggled a bit with this challenge. The card I ended up with was about 7th in the line of those cards discarded because for one reason or another I wasn't satisfied with them.... I suspect I need to do more heat embossing to get my mojo back! Anyhow, this one has a heat embossed swirl in the top left corner using versamark ink pad and gold detail powder. The topper was triple embossed with ultra thick to make an "enamel tile". I decided to do a simple card with a little embossing! I first embossed my text in gold powder then in a pearl white to make it more soft. next I done the flowers in the same way with the gold and then the pearl white. Added some ribbon and small gems to finish my card. I printed out a square and A4 sheet from the gorgeous Artylicious Seasons’ Greetings CD, and then embossed in white detail powder the fabulous baroque Christmas tree from IndigoBlu. The snowflakes are a Memory Box die, dies to die for an no mistake! The presents under the tree have been hanging around in my stash since forever. I am sure the team would appreciate it if you stopped by their blogs! ARGHHHH SORRY I understand Mr. Linky was AWOL, if he disappears again please add your link in the comments section.